In this review you can find out all the details about a product called Ting Antifungal Spray Powder. This product claims to provide quick relief to people suffering the painful symptoms of fungal infections, such as the sensation of burning, irritation, itching, cracking, scaling and chafing of the skin, and the general feel of discomfort. The powder also gets rid of the fungus which causes these infections, such as the tinea pedis (athlete’s foot), tinea curtis (jock itch) and tinea corpori (ringworm) species. If you are interested in the ingredients and pricing of Ting Antifungal Spray Powder, keep on reading to find out more. The active ingredient in Ting Antifungal Spray Powder, Miconazole Nitrate, is one of the most effective anti-fungal substances known to man, and works on the same basic principle as all other such substances. It can stop the infection from spreading, and eventually eliminate any fungal infection by inhibiting the production of one of the key components of the fungal cell membranes. Much like the active ingredient, the instructions for this product are identical to any other anti-fungal agent. Once you have cleaned and dried the area you wish to treat with Ting Antifungal Spray Powder, apply a thin layer of the substance and massage it into the skin so that the product may clean out the pores as well as the surface of the treated skin. This procedure must be repeated at least twice every day for four consecutive weeks in order to eliminate an on-going infection. Should the infection survive the treatment, or in the case of unwarranted irritation occurring due to the use of Ting Antifungal Spray Powder, make sure to see a doctor. Keep away from the face and children under the age of 2. Once again, this section is pretty much the same as with any other anti-fungal powder or cream. The ingredients contain substances to which a large chunk of the population is allergic to, and these compounds may cause side effects which are identical to the very symptoms Ting Antifungal Spray Powder claims to cure. Allergic reactions may include burning, itching, scaling, cracking, irritation, rashes and discomfort. The main offender here is the aluminium. Aluminium allergy is among the most common in the world. Ting Antifungal Spray Powder can be purchased from many re-sellers at different prices. For the purposes of this review, we looked at the Amazon listing, where a 4.5 ounce can of the product costs $6.09, with free shipping. Considering the average price of these products, this is fairly low for this size. While there is no guarantee for this product, as the distribution isn’t handled by the manufacturer, the overwhelmingly positive customer reviews help put any concerns to rest. Ting Antifungal Spray Powder is an effective, fairly priced product with positive customer reviews. However, we cannot overlook the lack of a guarantee, or the formula which is prone to causing painful side effects. 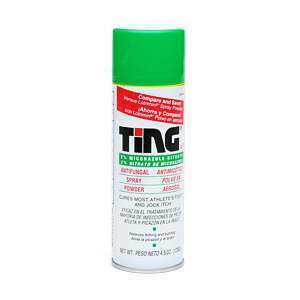 Jimmy Rodriguez	reviewed Ting Antifungal Spray Powder	on June 10th	 and gave it a rating of 2.5.